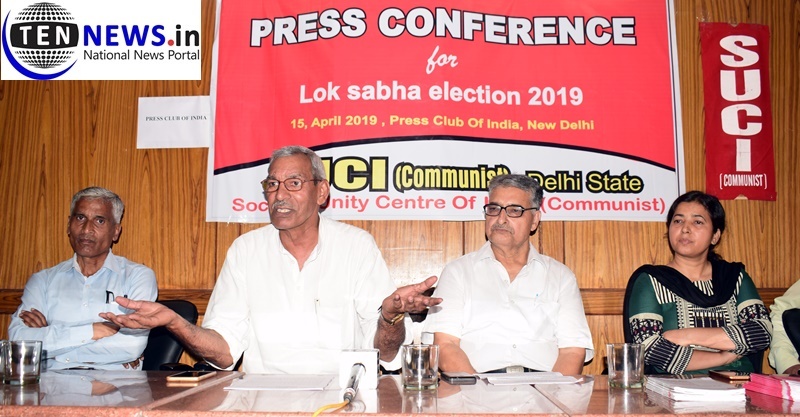 New Delhi : Central Committee of the Socialist Unity Centre of India (Communist) party has announced fielding of 119 candidates from 20 states and three Union Territories. The party is contesting all the 42 parliamentary seats in West Bengal. The Delhi State Organizing Committee of the party has also decided to field two candidates in Delhi, namely, Manager Chaurasia from the North East Delhi parliamentary constituency and Ritu Kaushik from the Chandni Chowk Parliamentary constituency. The party is of the opinion that the BJP, Congress and other regional parties, who are patronized and funded by the capitalist class, are busy showering false promises and diverting people’s attention from the real problems of their life. While in power, in the interest of the capitalist class, they repress and exploit people and when out of power, they shed crocodile tears for the people. The result is perpetual rule of the bourgeoisie and widening gulf between the rich and poor which has reached a pointwhere 1% rich own 73% of the national wealth. The common people, particularly the youth, are being dehumanized through economic and cultural degeneration, crimes on women are breaking all the previous records and the family system is on the verge of collapse.